Aromatherapy can be defined as a popular type of alternative medicine which takes advantage of volatile plant materials called essential oils and any other aromatic compounds with an aim of changing the mood, health, cognitive function and mind of a person. This alternative medicine is applied through numerous modes of application. The first one is through aerial diffusion which is usually characterized by aerial disinfection and environmental fragrancing. The second one is through direct inhalation which is usually characterized by decongestion, respiratory disinfection, expectoration and improving psychological health. Topical applications are also applied and these are basically done through general massage, therapeutic skin care, compresses and baths. Various materials are also used for aromatherapy and these include essential oils, absolutes, carrier oils, herbal distillates, infusions, vaporizer and phytoncides. Aromatherapy is also defined by a lot of experts as a practice which is characterized by using natural oils that are extracted from bark, leaves, roots, stems, flowers and any other part of the plant as a means of enhancing physical and psychological well-being. The aroma produced by the essential oils, once inhaled, are proven to be really effective in stimulating the proper functioning of human brain. The oils may also be absorbed by your skin and go deep into your bloodstream, thereby promoting healing. Other functions of aromatherapy include increasing cognitive function, offering pain relief and enhancing mood. It is also said to offer antiviral and antibacterial effects and works in providing the highest level of relaxation and clarity of mind. 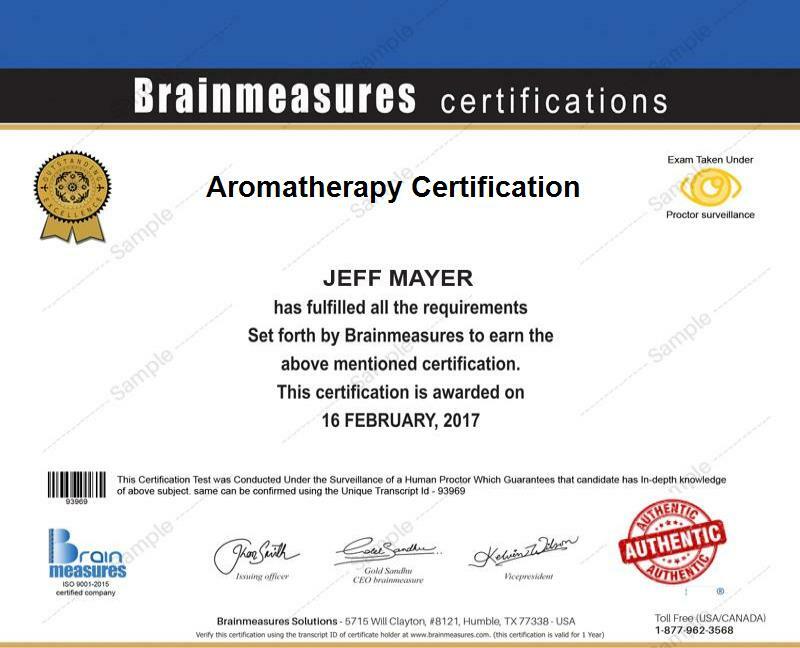 If you are aiming to become an expert/certified aromatherapist, then be aware that Brainmeasures, a highly impressive online certification company, can benefit you through the aromatherapy certification program that it offers. This aromatherapy course from Brainmeasures is extremely beneficial because its comprehensiveness and accuracy make it possible for you to understand everything about this specific alternative medicine. By deciding to take part in this online certification program, you will be able to enjoy the opportunity of accessing the company’s aromatherapy training which offers the highest level of information about aromatherapy, its scope, the health benefits that it can offer, the many materials used in effectively applying it and how you can take full advantage of its positive health effects. Once you complete this certification course, you will be able to reward yourself with the aromatherapy certificate that you will instantly receive from the company. How to effectively extract essential oils? How essential oils are absorbed into your bloodstream? Considering all the benefits that aromatherapy can offer, it is no longer surprising if more and more people are greatly interested about generating a more comprehensive understanding about it. The aromatherapy certification program which you can now access at Brainmeasures can definitely cater to the needs of all those who aspire to become among the most renowned experts in the field of aromatherapy considering its high level of accuracy and its well-detailed nature. Successfully completing an aromatherapy certification course is also a huge help in your attempt to earn higher in the aromatherapy industry. Once you finally take a hold of your aromatherapy certification, you will have an easier time working as an aromatherapy consultant which allows you to receive at least $51,000 per year. You can also use your online certification to become a clinical aromatherapist which allows you to earn an average annual salary of $85,000.